-Hydraulic Telescopic gangway 5.0 metreswith teak grate walkway. -Fresh water deck wash system with outlets forward and aft including deck wash hose kit. -Low level LED side deck lights 8 per side. -Fire and bilge flood monitoring alarm system 7 zone. -Bow Sunbathing Cushions with folding back rests. -Compass Swinging and adjustment with correction card. -Liferaft10 Man Canister stowed in a stainless steel cradle on theflybridge. -Generator -second Onan 27 kw 50 Hz. •Additional pair 12" Oval Mooring Cleats fitted to the aft lower edge of the hull band facing aft. • Pair of retractable cleats for tender on port and stbdcorners of platform. • Electric cooling unit for lower cockpit cool box. • Water purifier for ice maker -General Ecology Ultrafine in-line system with spare cartridge. • Hard top in GRP with stainless steel supports and retractable roof canopy. • SimradIS40 Speed/Depth Instruments with AirmarB744V depth/speed/temperature transducer a and SimradBSM-1 Module. • SimradAC12 Autopilot system with IS40 pilot display and QS80 pilot keypad. • Two 19" SimradMO19 displays. SimradNSO evo2 processor and SimradOP40 Controller and SD card reader. • SimradTX-06S 6kW 4 foot open array radar scanner. • SimradRS90 VHF Radio with DSC function with 2.4 metrewhip antenna. • SimradAIS Module with GPS and 2.4 metreAIS VHF antenna. • Bluetooth Upgrade speaker system. Additional pair of Fusion Cockpit 7” Marine waterproof speakers totalling4 with a 5 channel amplifierand remote control with Bluetooth audio connectivity. • Additional pair of Fusion Flybridge 7” Marine waterproof speakers totalling4 with a 5 channel amplifierwith 10” Fusion subwoofer and remote control with Bluetooth audio connectivity. • Fusion 7” waterproof fi xedBow speakers and Zone Amp with fi xedwaterproof remote control. • Fusion Marine CD Radio fi ttedin the saloon with Fusion Bluetooth connectivity for exterior speaker system. • Separate Miele W1613 washing machine and Miele T8722 tumble dryer in the Crew Cabin. • Marine Electric BBQ Grill on the Flybridge. • Underwater lights -LumishoreTIX202 LED x 4. • Dimmer switches on interior lighting. • Dinghy Inflator & socket 12 volt. • Electrically operated side opening window in the upper galley. • Water Maker Idromar130 litresper hour (MC2J-130). • Hydraulic SleipnerBow thruster SH300 and Hydraulic SleipnerStern Thruster SH240 system with Simultaneous dual Proportional controls. • Preparation for future fit of Flybridge Hydrauliс Crane. • 90 Metresof Galvanised10mm anchor chain. • Lewmar50Kg Delta Anchor -Stainless steel. • Chaffing bars for all mooring cleats. • Sprung mattress for double bed in the Forward Cabin. • Key lock for cabin door to the Forward VIP Cabin. • Key lock for cabin door to the Master Stateroom. • Bidet option for Tecmatoilet in the Aft Master Cabin Toilet Compartment. • Bidet option for Tecmatoilet in the Forward Toilet Compartment. • Television (size tbc) relocated to the Port side, outboard shelf of the Saloon. To be mounted on a rise and fall mechanism. See GA for location. It is important that the Television when lowered fits below a flush outboard shelf top which is no higher than the base of the Standard Window. • Outboards Saloon Window Pelmets reduced in Height. • Port and Starboard Sofa costing. • Modify Aft End of Galley and extend Bar Top. Delete standard end storage unit above bar top and inboard of Hob. See GA and Design Drawing for details. Saloon TV will be smaller than standard due to this change, size of TV. • Galley Bar design to reflect Drinks Cabinet in Low build straight/open grain satin finish Wengewith inset Polished Stainless Trims and Plinth. Bar Top to overhang base unit by 12mm, bar top + Galley Work top thickness to be 50mm with square edge. See Design drawings and GA. Stainless Steel Plinth detail to extend around the Galley up to Fridge Freezer. Bar Top and Worktop material tbc. • Cadorin-American Walnut Floor NOCSPOP10 in the Dining Area, Main Helm and NavigationaArea. • Base of Port Side Helm and Navigation L shaped Seating raised by 80mm compared to standard. • Special Helm Screen Divider with Electrochromic Glass, integrated into the top of the Bar unit (behind the Helm Seats). See design drawing and GA for details. • Special 2 x Mirrored Full height panels in the Lobby with 2'' Black American Walnut -Satin Finish strips either side. As boat 7451675. • Special Saloon Ceiling feature with Lacquer border. • Stainless Steel Detail on features surrounding Master Cabin Bed. • Two Special Mirrors in Master Cabin with changes to Audio Cabinet Door. • Additional Draw with associated changes to standard unit in Master Lobby. • Special Mirror feature above Vanity unit. • Specially ordered carpet with patterned pile in the main salon. • Panels either Side of Starboard Cabin Headboard (above Bedside Tables) finished in Black American Walnut -Gloss Finish, rather than soft lining. SYS Yacht Sales is pleased to assist you in the purchase of this vessel. 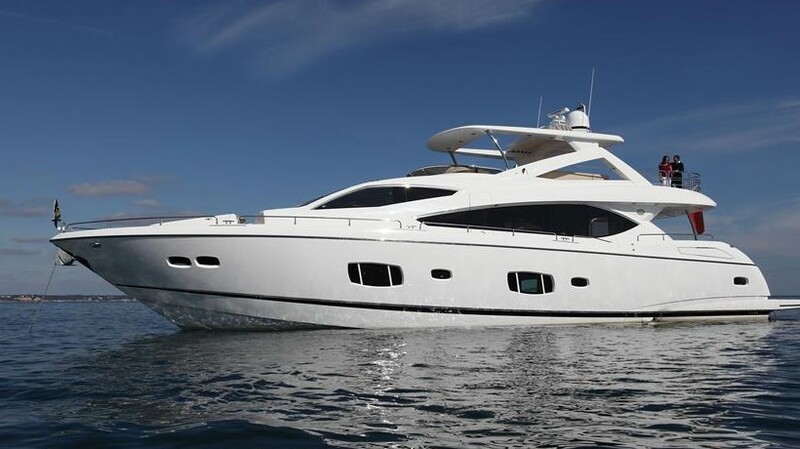 This boat is centrally listed by Sunseeker Russia.